Clark County is a county located in the U.S. state of Kentucky. As of the 2010 census, the population was 35,613. Its county seat is Winchester. The county was created in 1792 from Bourbon and Fayette counties and is named for Revolutionary War hero George Rogers Clark. Clark County is part of the Lexington–Fayette, KY Metropolitan Statistical Area. Many pioneers traveled through nearby Fort Boonesborough (alternatively known as Fort Boonesboro) in Madison County, Kentucky, before establishing permanent settlements in Clark County. At least nineteen pioneer stations (settlements) are believed to have been established in the area during the American Revolution. These included Strode's Station (1779), near Winchester; McGee's Station (ca. 1780), near Becknerville; Holder's Station (1781), on Lower Howard's Creek; and Boyle's Station (ca. 1785), one mile South of Strode's Station. Among the early settlers was a group of forty Baptist families led by Capt. William Bush, who settled on Lower Howard's Creek in 1775. In 1793 they erected the Old Stone Meeting House. Another early group founded the Tracy settlement, erecting a church building in the 1790s that survived into the early 20th century. When the Indian threat ended, commercial and agricultural enterprises began. Wharfs for loading flatboats were located along the Kentucky River and its tributaries. In the early 19th century, Clark County farmer began importing European livestock. Industries such as distilleries and mills thrived all through the county until 1820, when they began to be concentrated around Winchester. Clark County began in 1785 as Bourbon County, Virginia, when it was created from Fayette County, Kentucky (also then in Virginia). 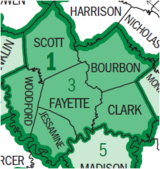 It was much larger area than present-day Bourbon County, as its original territory is now divided among Bracken, Boone, Campbell, Clark, Estill, Fleming, Floyd, Greenup, Harrison, Kenton, Mason, Montgomery, Lewis, Nicholas, Pendleton, Powell, and Robertson. Bourbon County is from which Bourbon whiskey evolved its name. Notable residents of early Clark County were Gov. Charles Scott (1808–12), Gov. James Clark (1836–39), Jane Lampton, the mother of Samuel Clemens, and sculptor Joel T. Hart. The Civil War divided the county, and about 1,000 of its men joined either the Confederate or Union forces. Confederate General John Hunt Morgan led his Confederate cavalry through the county on raids in both 1862 and 1864. The Elizabethtown, Lexington & Big Sandy Railroad reached Clark County in 1873, followed by the Kentucky Central in 1881, and the Kentucky Union (later abandoned) in 1883. The railroads helped make Winchester a transportation, commercial, and educational center, and gave rise to small service communities such as Hedges Station, six miles east of Winchester, and Ford, a once-prosperous mill town on the Kentucky River. A number of agricultural changes occurred in the postbellum years through World War II. When Clark County shorthorn cattle were not able to compete with the vast numbers of western cattle being hauled to market by the railroads, several county fortunes were lost and many farmers turned towards burley tobacco as a substitute. Hemp, which was grown to make rope, suffered from foreign competition and vanished as a cash crop around World War I. The crop was brought back during World War II and a processing plant was built in the county. When the war ended, so did the revival of hemp. In the 1950s and 1960s, industry began moving to the county, mostly around Winchester, aided by the completion of 1-64 and the Mountain Parkway, which by the mid-1960s formed a junction near Winchester. By 1986 manufacturing positions accounted for 25 percent of the employed labor force while another 25 percent was employed in other counties, many in nearby Fayette. The county remains a rich agricultural area, with farms occupying 95 percent of the land. Clark County is the birthplace of Beer Cheese, a regional delicacy that is growing in popularity across the country. Winchester hosts the annual Beer Cheese Festival in celebration of this Kentucky original treat. According to the U.S. Census Bureau, the county has a total area of 255 square miles (660 km2), of which 252 square miles (650 km2) is land and 2.7 square miles (7.0 km2) (1.1%) is water. The topography of the county is gently rolling. Tobacco is a major farm crop, and livestock are also raised there. Water sources include the Kentucky River, Red River, Lulbegrud Creek, and Boone's Creek. Lulbegrud Creek is named for Lorbrulgrud, the capital city of Brobdingnag, the land of giant people in Jonathan Swift's Gulliver's Travels. As of the census of 2000, there were 33,144 people, 13,015 households, and 9,553 families residing in the county. The population density was 130 per square mile (50 /km2). There were 13,749 housing units at an average density of 54 per square mile (21 /km2). The racial makeup of the county was 93.60% White, 4.77% Black or African American, 0.17% Native American, 0.20% Asian, 0.01% Pacific Islander, 0.53% from other races, and 0.71% from two or more races. 1.19% of the population were Hispanic or Latino of any race. There were 13,015 households out of which 33.40% had children under the age of 18 living with them, 57.90% were married couples living together, 12.10% had a female householder with no husband present, and 26.60% were non-families. 22.80% of all households were made up of individuals and 9.40% had someone living alone who was 65 years of age or older. The average household size was 2.51 and the average family size was 2.95. In the county, the population was spread out with 24.80% under the age of 18, 8.10% from 18 to 24, 30.30% from 25 to 44, 24.30% from 45 to 64, and 12.40% who were 65 years of age or older. The median age was 37 years. For every 100 females there were 93.60 males. For every 100 females age 18 and over, there were 89.80 males. The median income for a household in the county was $39,946, and the median income for a family was $45,647. Males had a median income of $35,774 versus $24,298 for females. The per capita income for the county was $19,170. About 8.40% of families and 10.60% of the population were below the poverty line, including 14.60% of those under age 18 and 11.70% of those age 65 or over. ^ a b "State & County QuickFacts". United States Census Bureau. http://quickfacts.census.gov/qfd/states/21/21049.html. Retrieved March 6, 2014. ^ "Clark County". The Kentucky Encyclopedia. 2000. http://www.kyenc.org/entry/c/CLARK06.html. Retrieved August 21, 2014. ^ Stewart, George R. (1967). Names on the Land (4th ed.). San Francisco: Lexikos. p. 151. ISBN 0-938530-02-X. This page uses content from the English language Wikipedia. The original content was at Clark County, Kentucky. The list of authors can be seen in the page history. As with this Familypedia wiki, the content of Wikipedia is available under the Creative Commons License.